Are you interested in getting ahead in your career? Shawn Achor, positive psychology expert and author of The Happiness Advantage, says that the path to career success is through happiness. Find out what you can do to put the principles of positive psychology to work in your own life and how doing so can help you enjoy greater productivity and fulfillment in your career. LoveToKnow (LTK): Please explain what positive psychology is and how it can benefit people seeking career success. 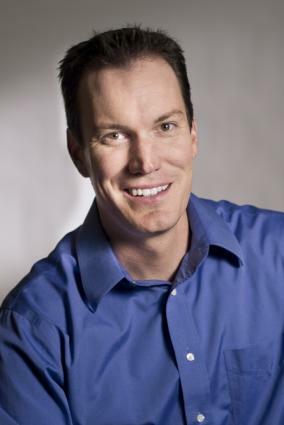 Shawn Achor (SA): Positive psychology holds that we've had the formula for success backwards all along; happiness fuels success, as opposed to the other way around. When we are positive, our brains become more engaged, creative, motivated, energetic, resilient, and productive at work. Rigorous research in psychology, neuroscience, management studies, and management of various organizations around the globe support these findings. LTK: What are the benefits associated with following the principles of positive psychology in the workplace? SA: Happiness leads to greater success, not vice versa. Our brains work best when we spend working hours in a positive mindset, instead of simply waiting for work to be over. Finding ways to be positive during challenging times not only makes us happier, but also greatly improves our productivity and performance. Studies have shown that maintaining a positive outlook improves work and productivity and in turn, increases success. By improving yourself and your environment to help facilitate achieving happiness, the rest will follow. LTK: What factors cause employees to experience a lack of happiness at work? SA: Employees tend to believe happiness is contingent with factors outside their hands. For example, they tell themselves they'll be happy once they get that promotion, and then once receiving that promotion, change the barometer of their happiness again, so it's a losing game. When challenges loom and we get overwhelmed, emotions hijack our rational brains. The Zorro Circle, discussed in The Happiness Advantage, teaches us to regain control by first focusing on small, manageable goals and then gradually expanding our circle to achieve bigger goals. When our brains get stuck in a pattern focused on stress and negativity, we set ourselves up to fail. The Tetris Effect teaches us how to retrain our brains to spot patterns of possibility, so we can see-and seize-opportunity wherever we look. LTK: What are the most important actions people can take to increase their levels of happiness at work? Brighten your environment: Everything around us-from the color of our walls to the mood of our coworkers-affects the way we think and feel. Certain environmental cues trigger our reflexive brain into unneeded panic, while others prime us for creative thinking or calm reflection. The good news is that we have the power to control much of this input. For instance, if the latest financial news always puts you on edge, turn off CNBC, take the stock ticker off your desktop, and distance yourself from conversations with colleagues who like to ruminate on the decrease of their stock portfolio. Instead, try to surround your desk with pictures and objects that bring you joy or make you think of fond memories-your mood and your brain will thank you. Invest in people: Smart people do stupid things during times of stress, such as shutting down their social networks to focus on work. In working with companies around the world, we found the greatest predictor of success during periods of stress and challenge is the quantity and quality of our relationships. Decades of research have revealed that social support may be the single greatest contributor to our personal happiness. Strong social bonds enrich our daily lives, give meaning to our work, and even improve our physical health. Now more than ever, take time to strengthen these connections, reach out to your colleagues, make more time for family, and rekindle friendships that have fallen by the wayside. You can start small by trying to make one genuine connection a day-whether it's a conversation with the security guard at work or a quick email to check in with your spouse, you'll immediately notice the positive boost it gives to your day. LTK: What suggestions do you have for people who want to increase their happiness levels at work? Think about work as a sprint, not a marathon: You know when you've been sitting at your desk too long-your muscles tense up, your eyes glaze over, and your energy lags. What you may not know is that after two hours of continuous work, your brain functions slower and your body accumulates stress and strain rapidly. Taking strategically placed energy breaks throughout the day counteracts this negative pattern. Try to split up your workday into short sprints of 90-120 minute increments and then take time for 5 minutes of recovery each increment. Walk down the hall or around the block, call a friend, listen to a calming piece of music, stretch on your office floor, or eat a high-protein 100-200 calorie snack, anything to refresh your mind during those small breaks. Not only will you feel more positive, but you'll see a big jump in your concentration and productivity. Find something to look forward to: One study found that people who just thought about watching their favorite movie actually raised their endorphin levels by 27 percent. Often, the most enjoyable part of an activity is the anticipation. If you can't take the time for a vacation right now, or even a night out with friends, put something on the calendar-even if it's a month or a year down the road. Then, whenever you need a boost of happiness, remind yourself about it. Anticipating future rewards lights up the pleasure centers in our brains just like the actual reward. 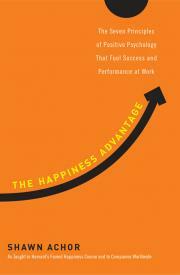 LTK: How can people who want to find greater happiness at work benefit from reading The Happiness Advantage? SA: Using stories and case studies from working with thousands of Fortune 500 executives in forty-two countries, The Happiness Advantage explains how to reprogram our brains to become more positive in order to gain a competitive edge at work. By training ourselves to be more positive and engaged, our work productivity will rise, we'll be more successful, and work will be more enjoyable overall. Are you intrigued? Ready to start putting the principles of positive psychology to work for yourself? To find out more about Shawn Achor's company, Good Think Inc., and the principles of positive psychology, visit www.shawnachor.com.